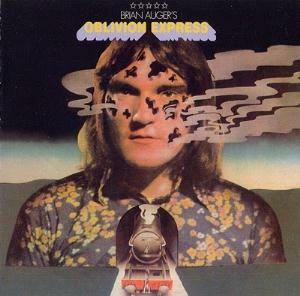 I wasn't even aware that Brian Auger & the Trinity (one of my favorite groups in those days) had disbanded when I strolled into the off-campus record store in early '71 and spotted Brian's menacing mug gracing the cover of his brand new "Oblivion Express" LP. However, I didn't hesitate for a second to plop down my precious few dollars and rush this album home to my awaiting turntable. I had faith that whatever "Auge" had put together was going to be high quality and I wasn't disappointed although the music was a surprising departure from what he had been creating with Thacker and Ambrose. Actually it was a surprising departure from most of the music that was out there in general. I didn't realize it at the time but what I was hearing was the true beginning of "heavy" jazz rock/fusion. Bear in mind that The Mahavishnu Orchestra had yet to release their unbelievable fury upon the world and Chick Corea's Return to Forever project was still a few years away from becoming a force of nature so when the gargantuan opening riff of John McLaughlin's "Dragon Song" came barreling through my speakers I was stunned. (I may be wrong but, to my knowledge, this is the first instance of what I think of as the fusion of hard rock and electric jazz.) What I know for sure is that I hadn't heard anything quite this intense and edgy in many a moon and I was exhilarated. Lead guitarist Jim Mullen plays a brief but eyebrow- raising ride, then Brian's fingers literally fly over the Hammond keyboard while drummer Robbie McIntosh and bassist Barry Dean provide a solid rhythm track underneath. I wasn't sure what to call this music but I was definitely intrigued with where they were taking me with it. The longest cut, "Total Eclipse," follows and it's a stalking, atmospheric piece where Auger combines piano and organ to create a hypnotic, pervasive mood. Mullen's solo wanders a bit but perhaps that was the point they were trying to make. This wasn't formula music and the old rules didn't apply. Brian's brilliant organ performance is an example of how to utilize and feature all the varied tones and settings that the Hammond B3 organ can generate in the hands of a virtuoso. His extended jam is spacey at first but then he brings his trusted jazz chops into play and demonstrates how delicate his touch is. "The Light" showcases Auger's limited but not unpleasant voice as the group charges ahead in a strong, confident groove that proves they weren't just some jazz purists that wanted to make a rock & roll record. Brian's short but hot organ ride provides the high point. "On the Road" is a bonafide rocker with jazzy accents where you first start to realize what an excellent drummer McIntosh is. The biggest complaint I have about Jim's guitar leads is that he sometimes gets too frantic (as he demonstrates here) but I have to remember that he was courageously venturing into uncharted realms of guitar land. To his credit, the McLaughlin-like tone he employs underneath Auger's fiery solo is gritty and effective. The straight-ahead rocker "The Sword" has Jon Lord's influence painted all over it and don't get me wrong, that's not a bad thing at all. The song is based around a heavy riff not unlike what Deep Purple was doing at the time and, in fact, I can only wish that Mr. Blackmore could have somehow made a cameo appearance because Mullen starts getting predictable at this juncture and Ritchie would have torn this baby up! Brian saves the day by effortlessly gliding through the many key changes during his ride without a pause. And, last but not least, the band makes an indelible statement of purpose with "Oblivion Express," another Purple-ish ditty where Robbie's drumming is superb and Jim puts together his best string of spicy licks. You just have to ignore the "terminally hip" lyrics (they simply reflect the idealistic dreams of the era) but when Brian's screaming Hammond solo evolves into what sounds like a steam locomotive from Hell you know these boys didn't shy away from creating a little out-of-control chaos from time to time. If you're expecting some cool, smooth jazz akin to what Brian and his former buddies would occasionally delve into on the Trinity LPs then you'll be disappointed with this album. There's not a ballad or even a quiet moment to be found. Just the passionate exuberance of four talented, young musicians that wanted to push the envelope of the jazz and rock world in order to see what would happen next. And many of us thought it was about time.